You are currently browsing the tag archive for the ‘pocket coil’ tag. I’m thinking of a number right now. Can you guess it? Let me offer a few hints. It’s between zero and a thousand. It’s a number that could change your morning disposition. But it has nothing to do with coffee. It’s a number that represents all that separates you from your tossing partner. It’s a number that you will never forget once you’ve come to feel its significance. No, not that number either. It’s the number that denotes the potential comfort you could be enjoying if you purchase a Simmons Beautyrest. 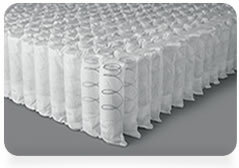 For the 800 patented non-flip pocket coils that cradle you in each Simmons mattress. 800 individual coils that work to give you the most comfortable, undisturbed sleep possible. 800 coils that are specifically made so you will never have to flip your mattress again. 800 tiny metal hands wrapped in soft yet strong fabric to cradle you to sleep. The first four disruptions are out of our control, but we can help with the final one. Sleeping with a partner on a Simmons is like having the comfort of two separate beds with the intimacy of one. Our patented pocket coil mattresses minimize motion transfer to your loved one. The coils also conform to the exact shape of your body, offering you unparalleled comfort levels. To learn more about Simmons mattresses visit www.simmonscanada.com or head straight to the source and purchase a new mattress with us, Simmons Mattress Gallery. Your partner will thank us. The Beautyrest Black has chartered new territory. By inventing a pocket coil that is 8” long, it is able to offer greater comfort, stability and support than ever before by ensuring that it is pre-compressed, to offer precise contouring to every inch of your body, all the while reducing ‘motion transfer’ from your partner. To top it off, the pocket coils are joined together, to guarantee you a great night’s sleep.